The advent of firearms has lead to a great variety of innovation in the field of alchemy. The eccentric Soot Slingers have taken a shine to the emerging field of firearms development and are hard at work creating a host of new devices, powders, and mechanisms in an attempt to make it into the history books. While sometimes more dangerous to themselves than their enemies, adventuring bands still highly value the Soot Slingers for their expertise in handling hazardous materials, their seeming unflappability, and their large arsenal of explosives and guns. Part gunslinger, part mad scientist, and more than a little unhinged, the Soot Slingers are constantly tinkering and experimenting, hoping to leave a lasting mark on history – rather than just the workshop floor. The Soot Slinger is a class focused on nimbly darting in and out of trouble, while laying down the law with their arsenal of dangerous black powder firearms and grenades. Skirting the fine line between insanity and genius, these daredevil chemists put their lives on the line each time their don their protective scrubs and cinch their gun belts up. Their main resource is Soot, which is generated each time the Soot Slinger uses one of their abilities. A boon and a danger, this alchemically empowered gunpowder residue boosts the damage they deal with their firearms, but can also catastrophically catch fire, detonating their carried alchemicals and engulfing the Soot Slinger and their companions in an explosion of fire and acid. In combat the Soot Slinger remains just behind the front lines, darting in to take the perfect shot and then using either their fancy shooting or alchemical tricks to deliver them back out of harm’s way. Soot Slingers can focus on either their firearms technology and skill, granting them the ability to quick draw on enemies and wield powerful black powder based weapons, or load themselves for bear with grenades and explosives letting them rain fire and acid on their enemies. 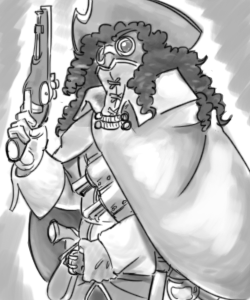 For all that their gear protects them from the flames and chemicals they work with, and their speed on the draw can shoot down the aim of rival gunslingers, when things get up close and personal the Soot Slinger falters. Enemies that can tie them down or match their speed can keep them from being able to fully utilize their tools and abilities and do serious damage to them in melee. It helps to always keep a sturdy friend around to keep the Soot Slinger away from whatever monster or ne’er do well wishes to do them in.